According to the latest report by TrendForce - Breakdown Analysis of China’s Semiconductor Industry, the outlook for China’s semiconductor industry has been tampered since the second half of 2018 due to pessimistic economy worldwide and uncertainties brought by the China-U.S. trade war, although the industry managed to reach a total revenue of over 600 billion RMB in 2018. Looking ahead to 2019, the revenue of China's semiconductor industry is expected to reach RMB 729.8 billion, but the annual growth rate would slow down to 16.20%, the lowest in the past five years. According to Jeter Teo, Research Director at TrendForce, there would be several challenges for China's semiconductor industry in the coming year, including the global economic slowdown, the overall weak demand, the negative growth in global smartphone production volume, as well as the continued trade conflicts between China and the United States. However, as the Chinese government continues to seek self-sufficiency of chips and aims at reducing its dependence on foreign companies, the domestic semiconductor industry will keep growing. On the other hand, new applications will trigger increasing demand for semiconductors, driven by emerging technologies like AI, 5G, autonomous driving, electric vehicles, CIS, biometric recognition, Internet of Things, and edge computing. It is worth noting that, recent years have seen the rise of China's domestic IC design industry, which has played a key role in leading the development of China's semiconductor industry. The industrial structure has continued to be optimized as well. For 2019, the sector of IC design is expected to account for 40.62% of China's semiconductor industry, while IC manufacturing would account for 28.68%, IC testing and packaging would take about 30.7%. 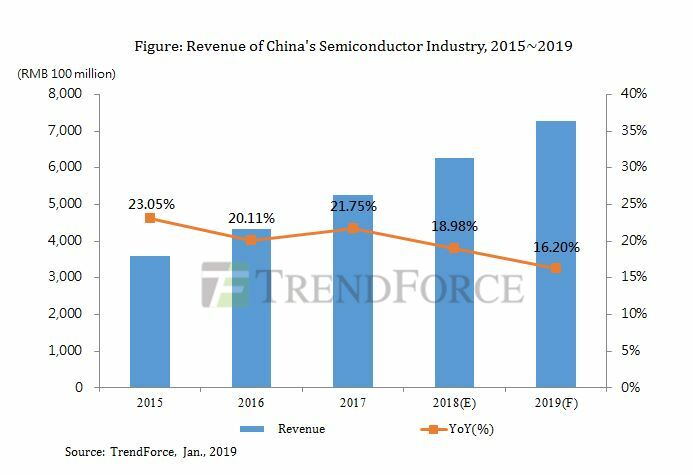 On the other hand, TrendForce’s data show that key sectors of the semiconductor industry are expected to register continued growth in revenue, with the growth rate of IC manufacturing reaching 18.58%, higher than 17.86% of IC design and 12% of IC testing and packaging. More than 10 new fabs for 12-inch wafer will enter production in China in 2019, while some 8-inch wafer fabs and the power semiconductor sector anticipate production expansion.